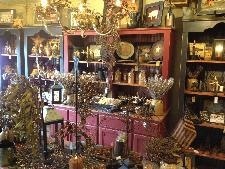 Thank you for visiting Olde Thyme Decor.com! We specialize in primitive home decor and hand-crafted furniture for the Kansas City area. We carry candles, pictures, signs, textiles, dolls, floral and pottery, lanterns, treenware, bowl fillers, room sprays, flags, lathe wood, book cases, chimney cabinets, night stands/side tables, hall trees. crock hutches, seasonal holiday items and many hand-crafted decor items.Stop in and visit our quaint, well-stocked retail store in Gardner, Kansas! Check out our products! Click "Products" link in left column. At present, our web site is still under construction. Some items are available for viewing some are not. We are making an effort to present you with our entire spectrum of offers as soon as possible. Even though our website is not complete, we are open for business and would be very excited for you to drop by and visit!